(UPM, Shanghai, 8 November 2018 at 10:30 EET) - Today UPM celebrates its 20th anniversary in China with a ceremony at the national booth of Finland at the China International Import EXPO (CIIE) together with government officials from Finland and China, business partners and customers. During the ceremony, Jussi Pesonen, President and CEO of UPM and Bernd Eikens, Executive Vice President of UPM Specialty Papers shared UPM's continued commitment and vision for the Chinese market. In the past 20 years, UPM has invested more than USD 2 billion in China, which is the single largest investment from Finland. UPM's environmental investments amount to USD 80 million. "UPM has witnessed the development of China's economy; which provides great potential for all of us," says Jussi Pesonen. "Today, we can proudly say that China plays an increasingly strategic role in UPM's global development. As China continues its transformation towards a green economy, we provide the most innovative and responsible forest-based solutions that support sustainable development." UPM's strong focus on sustainability and innovation is fully displayed at CIIE, through its cutting-edge Biofore Concept Car which was exhibited at the national booth of Finland. 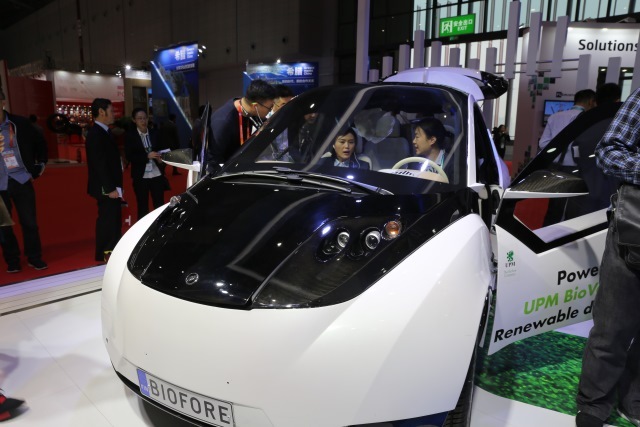 The car is made out of UPM's innovative and renewable forest-based materials, showcasing the "UPM Biofore - Beyond Fossils" brand promise to Chinese stakeholders. Since its first investment in 1998, UPM's business has grown rapidly in China with cumulative investments of more than USD 20 million. Today, our operations include the UPM Specialty Papers Paper Mill, the Asia R&D center, and a UPM Raflatac factory located in the Changshu Economic Development Zone, Jiangsu province. UPM has also established a national sales network supporting its Specialty Papers, Raflatac (label), Pulp, Timber and Plywood business. We employ approximately 1,800 employees in China.